Deb is a self taught Calligrapher and Artist. She started drawing and painting at an early age. In high school she fell in love with Calligraphy and painting. Her art teacher was instrumental in helping her discover the wonderful world of the Art of Lettering (Calligraphy). For over 30 years she has studied and developed her own style of Hand Script Calligraphy for wedding and birth certificates, dairy cattle show signs, banquet programs and more. From this experience, her Calligraphy has been published in local, state and national dairy agricultural magazines with logos also designed by her. Most recently she has found Hand Engraving as a new avenue to use her skills as a calligrapher. For this she uses an ultra high speed, diamond tipped devise to script into crystal and other surfaces. To add to the uniqueness of Deb's Studio, she has spent over 30 years developing her skills as an accomplished painter doing animals portraits, decorative painting, pen and ink, and watercolor. She has found enormous enjoyment in creating her animal portraits and custom work for customers, just to see client's faces light up with joy. She also finds great enjoyment teaching and sharing with others the skills she has learned throughout the years in color, techniques and seeing the students really enjoy the projects they complete. Deb has been a member of the Society of Decorative Painters since 1982. she is a current member of the Penn Woods Painters chapter. Introduced to tole and decorative painting while living in Fresno, California, she studied under Kathy Langdon and her sister Anitia. This lead her to embrace the art of decorative painting. Upon moving back to her home state of Pennsylvania she began attending craft shows in South Central Pa. Inquires came from individuals wanting to learn how to paint. Deb decided to start teaching painting classes in her home and then at the local high school adult education classes, where she is currently sharing her painting skills. She enjoys offering the community this opportunity to learn how to paint. Deb’s most outstanding accomplishments include the logos designed for the Pennsylvania Holstein Association conventions, the Christmas ornament that was selected to hang on the White House Christmas tree in 2004, the Cumberland County Historical milk can, and the dairy cows painted on jars. The Society of Decorative Painter offered the membership the opportunity to design ornaments for the White House for 2004. Deb’s ornament was chosen with 349 other beautiful ornaments from all over the world. A special reception was held for all the ornament painters. What a wonderful experience. Deb has recently been certified as a Ralph Lauren Paint Professional. 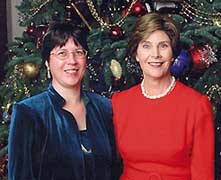 NOTE: The photograph (at top of page) was taken at the White House with Laura Bush, the Christmas of 2004. Deb's ornament was selected for display in the Blue room.